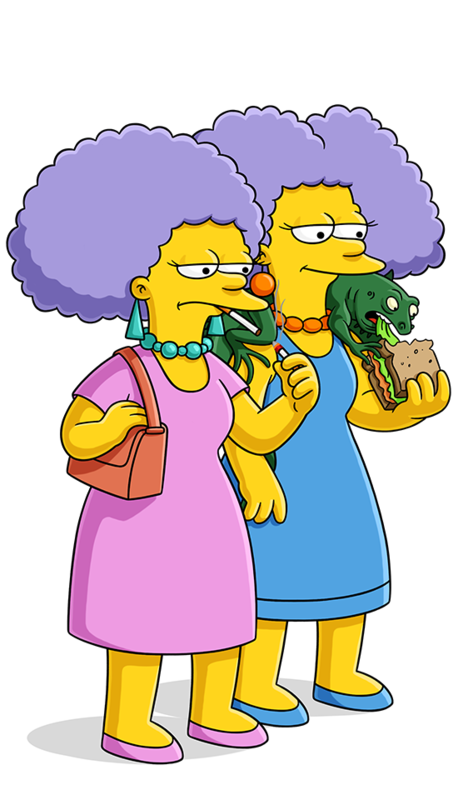 Marge Simpson's sisters who work at the Department of Motor Vehicles. Raspy voiced, chain-smoking, snort-laughing, Homer-hating, MacGyver loving, 40-ish twins. They have a pet iguana named Jub-Jub. Selma married Troy McClure, but later found out it was a sham to further his career. Say: "MacGyver -- what a dish!" Sideshow Bob proposes to Selma. They say everyone can float in the Dead Sea, but Selma sank right to the bottom. You did this? With your fat fingers? And your brain the size of a Superball?